The title doesn't lie: These are the fudgiest brownies that ever lived. But they didn't live long. We scarfed down this batch fast, indulging after a long week of multiple moves and all the headaches that go along with relocating. Okay, so we just moved to the building next door, but it's still a move! We're now in a lovely ground floor suite, which means I get a yard and several hundred more square feet - including a lot more kitchen space. It's so refreshing to be have enough cupboards for all my things, and the space to use them. But enough about me, and more about you. 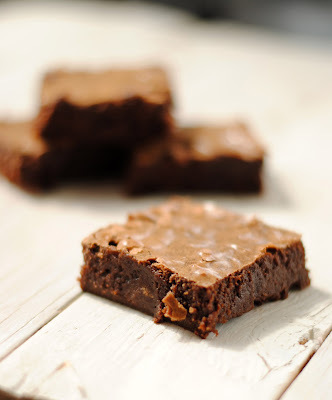 Go make these brownies now! It will be the best thing you've done all day. Pour batter into a greased 9x11-inch pan and spread evenly, then bake for about 25-30 minutes.